Family Poaceae Barnhart., genus Triticum L., species Triticum aestivum L. (Cherepanov, 1995). Triticum vulgare Host; T. hybernum L.; T. sativum Lam. ; T. vulgare Vill. ; T. aestivum L. emend. Fiori et Paoletti; T. cereale Schrank; T. sativum tenax a. T. sativum vulgare Hack. ; T. sativum subsp. Tenax Al. ; T. sativum vulgare Asch. Et Gr. ; T. compactum Host. 2n=42. An herbaceous annual 60-180 cm tall. Wheat has a fibrous root. Embryo, coleoptile and nodose roots are distinguished. Embryo roots appear at time of seed germination, while coleoptile roots grow from an underground coleoptile node. Together they form the primary root system, which penetrates the soil to great depths without noticeable branching in the upper soil layers. Nodose roots appear from connivent underground nodes of the main shoot and of lateral shoots. These roots are located in the upper soil layers. During favorable years, wheat plants are mostly nourished through nodose roots, while during droughty years, these roots develop poorly, if at all, and wheat plants only obtain water and mineral matter through their primary root system. Underground connivent nodes occur in the bushing out zone or at the tillering node. Lateral shoots are formed in the axils, which correspond to these nodes. The occurrence depth of tillering nodes is very important. The less the depth, the greater the bushing out, provided there is sufficient moisture. However, insufficiently deep tillering nodes are more affected by droughts and frosts. Wheat plant stalk is divided into nodes and internodes. It is hollow or full of loose parenchymal matter. Wheat leaves consist of a sheath around the stalk and a linear leaf lamella. There, where the leaf lamella bends outward, there is a ligule protecting the inner sheath from rain water (even though some wheat varieties have no ligule). The lower part of the sheath is fixed to the base of the stalk node, forming a bulge above it, which is the leaf node. Wheat inflorescence is a compound spike. It consists of a rhachilla and spikelets on its edges. Each spikelet has 2 glumes and 3-4 florets. Each spikelet may have up to 5-6 well-developed florets. The best developed florets are located somewhat below the middle of the spike. At the base of the spike, there are usually 1-2 underdeveloped spikelets. The first and second florets in a spikelet are the best developed. The upper florets in a spikelet are underdeveloped and do not bear grains. A wheat floret consists of an outer pale and an inner pale, the pistil with two pinnate stigmae, three stamens and three lodicules at the base of the floret. While blossoming, the lodicules swell and push aside the pales. Wheat fruit is a caryopsis. 1000 wheat grains weigh 10-16 g.
Common wheat is extremely polymorphous. There are winter and intermediate varieties. Winter varieties' vegetation is interrupted by a period of hibernation, the duration of which increases in southern regions. The sprouts of the most cold-resistant wheat varieties can survive short-term spring frosts of -10°C. The critical temperature for the most cold-resistant winter wheat varieties at the depth of their tillering node is close to -18°C. During its vegetation period, winter wheat needs an average daily effective heat sum of about 2100°C. This crop is rather fastidious about moisture supply, especially while forming leaf tubes and during grain ripening. Droughts greatly reduce grain yield. Vegetation period in winter wheat lasts 45-50 days in autumn (during the development of vegetative organs) and 75-100 days in spring and summer (during the formation of generative organs and fruit). Winter wheat plants dislike soils with high acidity, though they are less sensitive to soil salinization. Winter wheat thrives in black earth. In sod-podzol soils, yields are high, provided fertilizers are applied. Most winter wheat varieties react to shorter day lengths with longer vegetation periods, even though there are varieties indifferent to day length. Winter wheat is self-pollinating. Cross-pollination is also possible, as most winter wheat flowers blossom openly (being chasmogamic). The anthers open inside a closed flower, but some pollen remains in them. After the flower opens and the anthers emerge, the remaining pollen is carried away by the wind. Blossoming begins in the middle of the spike and spreads up and down. The first to blossom are the lower flowers in the spikelets, followed by the second ones, etc. In moderately warm weather, each spike blossoms for 3-4 days. Blossoming follows a certain pattern and begins at 5 or 6 o'clock in the morning. Its peak in Russia.s moderate climate areas occurs from 8 a.m. to 10 a.m. Then blossoming slows down. Afterwards, there is a second peak, and the spike gradually ceases to blossom. The hotter the climate, the earlier the first peak occurs, and the later the second peak occurs (when the heat abates). A few flowers open at night. In cloudy, cool weather, the blossoming pattern is smoother. The upper flowers (the 4th or 5th flower in the spikelet) are cleistogamic. Common wheat is originally from Transcaucasia. It has been cultivated in Turkey, Iran, Iraq, Syria, and Turkmenistan since the 7th or 6th millennium B.C. In Western Europe, it has been cultivated since the 6th or 2nd millennium B.C. In Northern Caucasia, it has been cultivated since the 1st millennium B.C. In Belarus and the Baltic countries, it has been cultivated since the 4th or 5th century A.D. Wheat was introduced to South America in 1528 and to the future United States in 1602. In Canada, it has been cultivated since 1802, in Australia since 1788. Wheat's habitat encompasses all agricultural areas of the world. In the north, wheat is cultivated up to 66°N in Sweden. It is cultivated as far south as the southernmost territories of Australia, South America and Africa. Wheat is mainly a steppe crop. In Europe, it is cultivated predominantly in the steppe and forest-steppe areas; in North America, it is cultivated in the prairies; in South America (Argentina), it is cultivated in the pampas. In the foothills, wheat is cultivated at elevations of 4,000 m above sea level. Common winter wheat is cultivated everywhere in Russia (it occupies two thirds of all agricultural lands), but mostly in Northern Caucasia and in the Central Black Earth Belt. 135 wheat varieties were approved for cultivation in specific areas of the Russian Federation in 2004. The main varieties include Bezenchukskaya 380, Bezostaya 1, Don 93, Don 95, Ermak, Zarya, Inna, Lgovskaya 167, Lyutestsens 9, Mironovskaya 808, Moskovskaya 39, Omskaya ozimaya, Prikumskaya 140, Saratovskaya 90, Svetoch, Kharkovskaya 92, Tarasovskaya 29, etc. The main breeding agencies include the P.P Lukyanenko Krasnodar Research Institute for Agriculture, the N.M. Tulaykov Samara Research Institute for Agriculture, the Belgorod State Agricultural Academy, the Central Non-Chernozem Belt Research Institute for Agriculture, the Orenburg State Agricultural University, the Siberian Research Institute for Agriculture, the Research Institute for Agriculture of Southeast, the North Kuban Agricultural Experimental Station, etc. In 2001, wheat (both winter and spring) was sown on all categories of farms on 23,757,000 hectares (50.3% of all areas cultivated with cereal crops). On average, wheat yields 2,000 kg per hectare. Wheat is a leading crop in the world. No other crop occupies larger territories or yields more. It is a staple food crop. Wheat grains are processed to produce flour (for baking and confectionery products), cereal, etc. They are also used to produce mixed fodder. Those wheat varieties that have big, rounded grains with a shallow furrow yield more flour than the others. Common wheat includes strong wheat varieties (with hard grains), medium wheat varieties and soft wheat varieties. Grain hardness of strong improving wheat is usually no less than 70%, its raw protein content is no lower than 15-16% of absolutely dry matter, raw gluten content of 100%-yield flour should be no less than 28%, and of 70% yield flour no less than 30-35%. Gluten must be of high quality (with good elasticity, stretching 12-18 cm). It should ensure the production of a considerable amount of high-quality bread. Strong wheat varieties possess the ability to preserve their high baking quality even with the addition of 20-40 % soft wheat grains. Wheat from the Saratov, Volgograd and Samara regions has the highest protein content in Russia. Fodder wheat varieties are high in protein and deficient amino-acids (lysine, tryptophan), but the baking quality of their flour is low. Bran and other grinding waste are used as a concentrated fodder. Wheat straw is used as bedding; for the production of paper, cardboard, and wicker goods; and as livestock roughage. 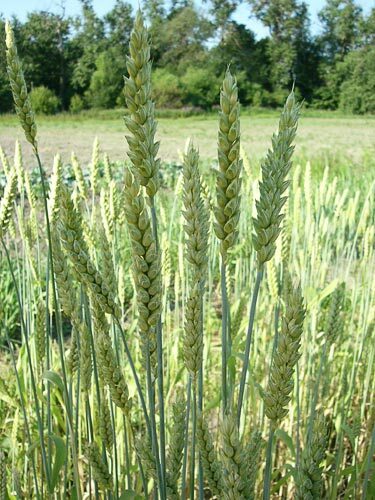 Wheat herbage is used as additional livestock fodder in spring. Winter wheat is sown over black and full fallow and perennial herbs after lupine, peas and other crops. 20,000-60,000 kg per hectare of manure or compost are used as main fertilizers. Also applied are 40-100 kg of N per hectare, 40-80 kg of P2O5 and up to 60 kg of K2O per hectare. When sowing, up to 40 kg of P2O5 per hectare are applied to the drills. 30-60 kg of N and 30 kg of P2O5 are applied per hectare as additional early-spring fertilizers. With watering and cultivation of intensive varieties, doses of fertilizers are increased. Wheat is sown in drills (with 15 cm between drills) and closed drills (7-8 cm). 180-250 kg of seeds are usually planted per hectare (4-7.5 million seeds). Planting depth is 3-8 cm. Wheat is harvested using a two-phase technique or with direct harvesting. The soil is prepared with general-purpose machines. Wheat is sown with grain-sowing machines. It is harvested with harvesters, threshers and reaping machines. Brezhnev, D.D., ed. 1976. Wheat Varieties of the World. Leningrad, 487 p.
Cherepanov, S.K. 1995. Vascular Plants of Russia and Neighboring Countries. Moscow, pp. 770-774. Dorofeev, V.F., Korovina, O.N. 1979. Cultivated Flora. Wheat. Leningrad, p. 347. Konovalov, Y.B., ed. 1990. Individual Selection of Field Crops. Moscow, pp. 216-235. State Register of Breeding Achievements Approved for Practical Application in the Russian Federation in 2004. 2004. Moscow, pp. 5-7. Zhukovsky, P.M. 1964. Cultivated Plants and Their Congeners. Leningrad, pp. 99-144.